how old you are, when you got the basket. with needles. She bends to brush them from your shoes. breath of moss and blue spruce. she says, and the water moves, turns to a black river. You taste your thumb: soft brine. you want to swim. Her words are a crow made of rain. muscling through the night grass, oiling the frost. come close enough for this. and too wet to burn. 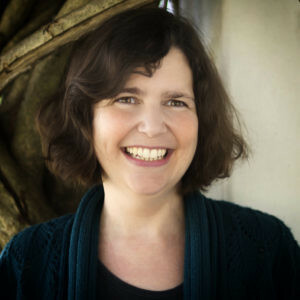 Sally Rosen Kindred is the author of two poetry books from Mayapple Press, No Eden (2011) and Book of Asters(2014). She has received two poetry awards from the Maryland State Arts Council, and her poems have appeared in Blackbird, Quarterly West, and Linebreak, and are forthcoming in The Adroit Journal. She teaches writing online for Johns Hopkins University CTY.